A concentrated and balanced blend from plant and animal sources plus natural rock minerals (without lime) for both quick and sustained feeding of vegetable crops. Derived From: Fish bonemeal, feathermeal, rock phosphate, langeinite, bonemeal greensand, alfalfa meal, and kelpmeal. Other ingredients include glacial rock dust, azomite, volcanic rock dust, lignite, copper sulfate, zinc sulfate, and manganese sulfate. Notice: Information received by the Washington State Department of Agriculture regarding the components in this product is available on the internet at http://agr.wa.gov. 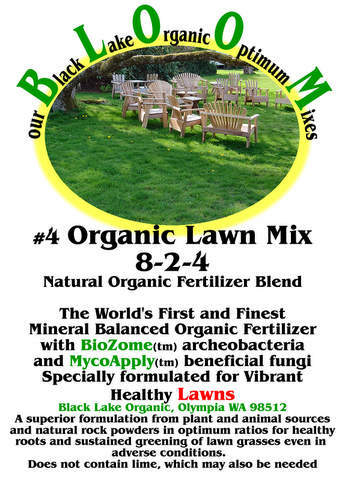 Application: For best results, apply 5 lbs per 150 sq feet or 30 lbs per 1000 sq feet and work into the top 6 to 8 inches of soil along with 1 inch of quality compost or aged manure, as needed. Mix or till thoroughly and allow 1 week for odors to fade before sowing. 1 cup weights about 8 ounces. 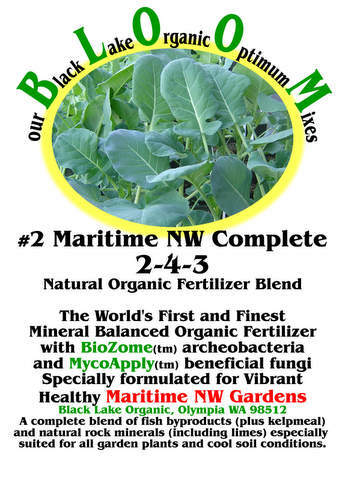 Specially formulated for vibrant healthy Maritime NW Gardens and plants requiring lime. A complete blend of fish byproducts plus kelpmeal and natural rock minerals including limes especially suited for all soils in cool climate conditions. Derived From: fish bonemeal, fishmeal, rock phosphate, kelpmeal, lime, dolomite, langbeinite, and sulfate of potash. Other ingredients from glacial rock dust, Azomite, volcanic rock dust, lignite, copper sulfate, zinc sulfate, and manganese sulfate. 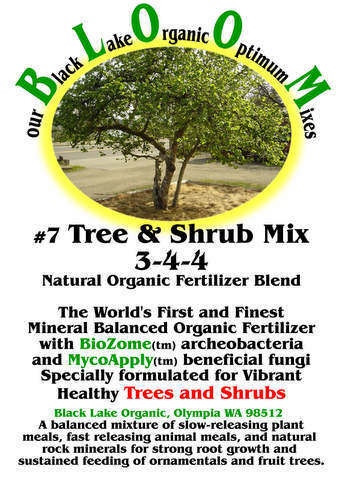 Application: For best results, apply 5 lbs per 100 sq feet or 50 lbs per 1000 sq feet and work into the top 6 to 8 inches of soil along with 1 inch of quality compost or aged manure, as needed. Mix or till thoroughly and allow 1 week for odors to fade before sowing. 1 cup weights about 8 ounces. Specially formulated for vibrant healthy VEGAN Gardens. Contains NO Animal Products. 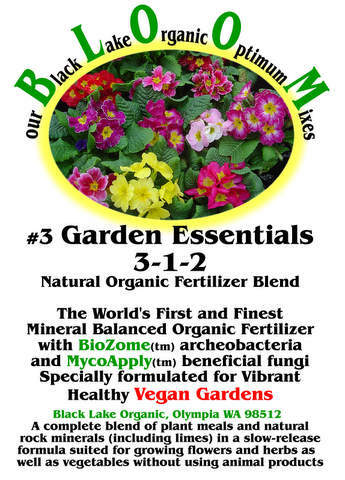 A complete blend of plant meals and natural rock minerals including limes in a slow-release formula suited for growing flowers and herbs as well as vegetables without using animal products. Derived From: Soybean meal, rock phosphate, kelpmeal, alfalfa meal, dolomite, lime, and sulfate of potash. Other ingredients from glacial rock dust, Azomite, volcanic rock dust, lignite, copper sulfate, zinc sulfate, and manganese sulfate. Application: For flowers and herbs apply 5 lbs per 100 sq feet. For vegetables use 5 lbs per 50 sq feet or 50 row feet. Work into the top 6 to 8 inches of soil along with 1 inch of quality compost or aged manure, as needed. Then sow or transplant crops and water them. 1 cup weights about 8 ounces. Specially formulated for vibrant healthy lawns. A superior formulation from plant and animal sources and natural rock powders in optimum ratios for healthy roots and sustained greening of lawn grasses even in adverse conditions. This product does not contain lime which may also be needed. Derived From: Feathermeal, bloodmeal, fish bonemeal, kelpmeal, bonemeal, rock phosphate, langbeinite, sulfate of potash, and alfalfa meal. Other ingredients from glacial rock dust, Azomite, volcanic rock dust, lignite, copper sulfate, zinc sulfate, and manganese sulfate. Application: For healthy lawns, apply 5 lbs per 1,000 sq feet in spring, summer and fall along with an equal amount of garden lime (not dolomite). For new and poor lawns use 10 lbs of lawn food mix per 1,000 sq feet. For sandy soils apply only 5 lbs per 1000 sq feet in spring and fall. 1 cup weights about 8 ounces. A rich blend from animal and plant sources including bone meal and kelp meal with rock minerals providing the full range of nutrients needed for strongly flowering bulbs and tubers. Derived From: Fish bonemeal, feathermeal, bonemeal, kelpmeal, bloodmeal, alfalfa meal, langbeinite, and dolomite. Other ingredients from glacial rock dust, Azomite, volcanic rock dust, lignite, copper sulfate, zinc sulfate, and manganese sulfate. Application: Incorporate 5 lbs mix per 100 sq. ft. along with 1/2 inch quality compost or aged manure into the top 8 inches of the flowerbed. For individual bulbs, stir 2 tablespoons of B.L.O.O.M. mix into the hole in the dirt that covers the bulb. 1 cup weights about 8 ounces. 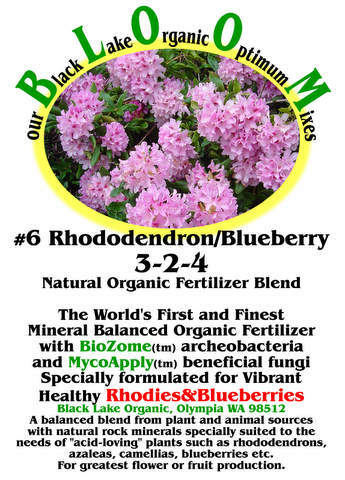 A balanced blend from plant and animal sources with natural rock minerals specially suited to the needs of "acid-loving" plants such as rhododendrons, azaleas, camellias, blueberries... etc. for greater flower or fruit production. Derived From: Cottonseed meal, greensand, langbeinite, kelpmeal, bonemeal, feathermeal, and rock phosphate. Other ingredients from glacial rock dust, Azomite, volcanic rock dust, lignite, copper sulfate, zinc sulfate, and manganese sulfate. Application: Incorporate 5 lbs. mix per 100 sq. ft. or 1 c. per 16 sq. ft. into the top 6 in. of soil. After covering roots, add 1/2 in. of aged manure or quality compost and cover with 4 in. of bark mulch. Each spring and fall carefully remove the mulch and sprinkle half a c. of mix per c. of height under the canopy; then water, and return the mulch. Add bark mulch to 4 in. thickness. 1 c. weights about 8 oz. A balanced mixture of slow-releasing plant meals, fast releasing animal meals, and natural rock minerals for strong root growth and sustained feeding of ornamentals and fruit trees. Derived From: Fishbonemeal, soybean meal, cottonseed meal, rock phosphate, langbeinite, calcitic lime, kelpmeal, and sulfate of potash. Other ingredients from glacial rock dust, Azomite, volcanic rock dust, lignite, copper sulfate, zinc sulfate, and manganese sulfate. Application: After planting, clear an area 4 or 5 feet in radius of all turf grass, etc. and work 1lb of mix into top inch of soil. Water the ground. Add 1/2 inch of quality compost or aged manure and cover cleared area with 4: bark mulch. Each spring and fall remove mulch, apply 1 cup per foot of height under canopy and remulch using cardboard or newspaper and bark. 1 cup weights about 8 ounces. A balanced blend from plant and animal sources with natural rock minerals for feeding strawberries, raspberries, gooseberries, currants and other can and bramble fruits. Derived From: Fish bonemeal, feathermeal, soybean meal, kelpmeal, alfalfa meal, crab meal, lanbeinite, and rock phosphate. Other ingredients from glacial rock dust, Azomite, volcanic rock dust, lignite, copper sulfate, zinc sulfate, and manganese sulfate. Application: Apply 1/2 lb per 10 row ft. or 10 sq. ft. each spring. Scratch into soil an cover with 1/2 in. quality compost or aged manure. Water the ground then top with 4 inches of ground bark or other organic mulch material. 1 cup weights about 8 ounces. A balanced blend from plant and animal sources (including alfalfa and kelp meals) plus natural rock minerals. 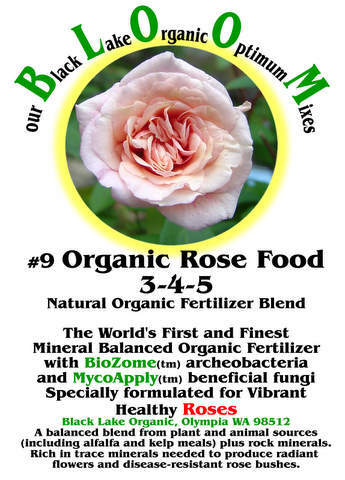 Rich in trace minerals needed to produce radiant flowers and disease-resistant rose bushes. Derived From: Alfalfa meal, fish bonemeal, soybean meal, kelp meal, calcitic lime, lanbeinite, feathermeal, and sulfate of potash. Other ingredients from glacial rock dust, Azomite, volcanic rock dust, lignite, copper sulfate, zinc sulfate, and manganese sulfate. Application: After planting, clear an area 4 or 5 feet in radius of all turf grass, etc. and work 1lb of mix into tops soil. Add 1/2 inch of quality compost or aged manure and cover cleared area with 4" bark mulch. Each spring and fall remove mulch, apply 1 cup per foot of height under canopy and re-mulch using cardboard or newspaper and bark. 1 cup weights about 8 ounces. 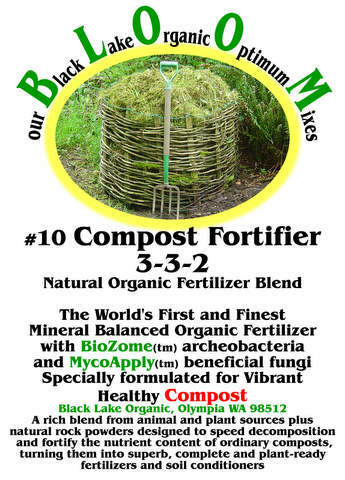 B.L.O.O.M #10 Compost Fortifier 3-3-2A rich blend from animal and plant sources plus natural rock powders designed to speed decomposition and fortify the nutrient content of ordinary composts, turning them into superb, complete and plant-ready fertilizers and soil conditioners. Derived From: Fishmeal, fishbone meal, kelpmeal, alfalfa meal, greensand, rock phosphate, oystershell flour, lanbeinite, sulfate of potash, and dolomite. Other ingredients from glacial rock dust, Azomite, volcanic rock dust, lignite, copper sulfate, zinc sulfate, and manganese sulfate. Application: Compost Fortifier aids pile decomposition. Cycling minerals and (organic fertilizer) materials through compost increases their effectiveness and makes a superior compost. For a 3' x 3' x 3' compost bin, spread 1lb of mix over each 1 ft layer of plant matter and lightly water in. a 5 lb bag is needed for a 3' x 3' x 3' pile. Apply compost in 1/2 inch to 1 inch layer on garden beds. 1 cup weights about 8 ounces. Note: 3' x 3' x 3' = 27 cubic feet = 1 cubic yard. 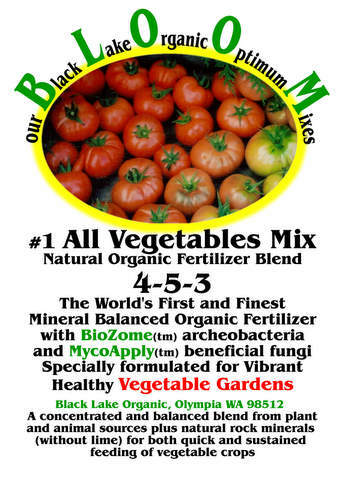 The World's First and Finest Mineral Balanced Organic Fertilizer with BioZome(tm) archaeobacteria and MycoApply(tm) beneficial fungi Specially formulated for Vibrant Healthy Vegetable Gardens. 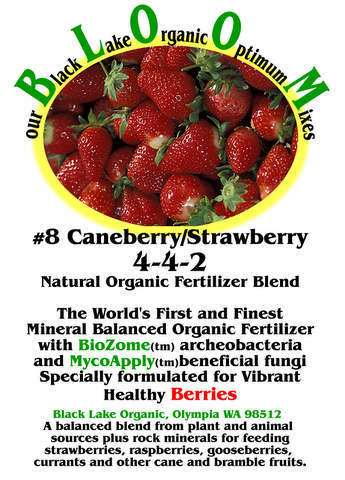 These organic fertilizers differ from all others by ensuring a full complement of nutrient minerals in addition to the organic elements in carbohydrates. 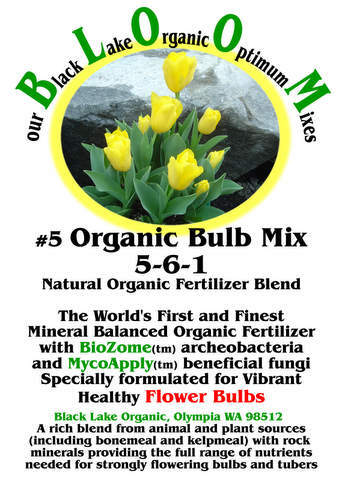 BLOOM stands for: Black Lake Organic Optimum Mix and each of the blend varieties matches the macro-nutrient ratio for its specific class of plants, as well as harmoniously balancing the amounts of secondary and micro-nutrients. In addition, the fertilizing efficiency of these natural minerals is enhanced by the special decomposition and symbiotic microbes and fungi supplied in each blend. We are confident you will be satisfied with vibrant healthy lawns, trees, flowers and the most nutritious and tastiest produce.